Had this book not been chosen by my face-to-face reading group, I probably wouldn’t have come across it, but I’m glad I did. 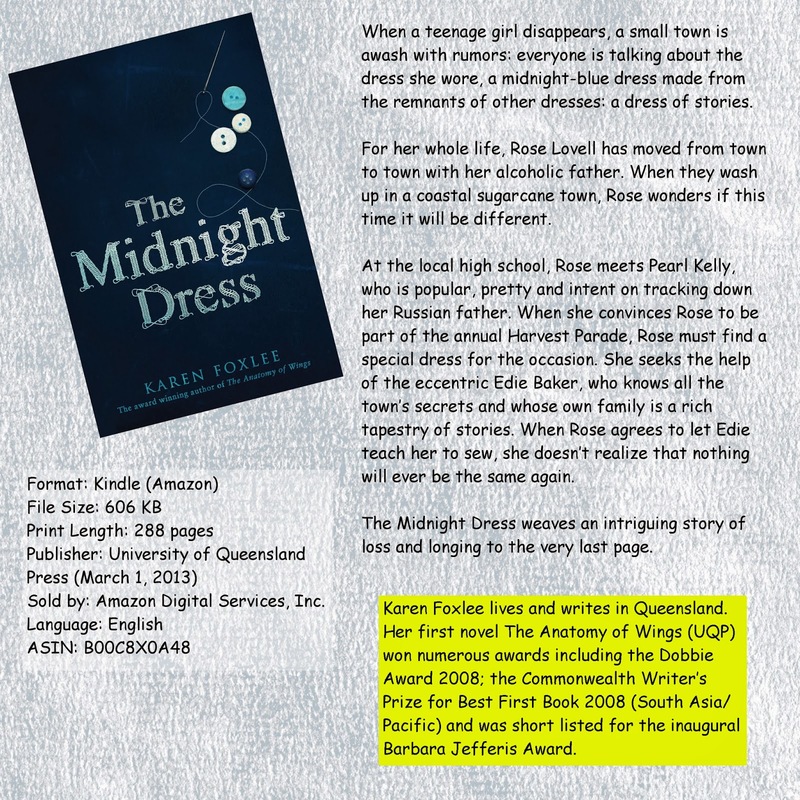 Karen Foxlee is a new-to-me Australian author. Apart from anything else, the structure of the book is unusual and interesting. After the annual Harvest Parade in which they both participated, two girls are missing in a coastal sugar cane town in mid-northern Queensland. Each of the chapters is headed with the name of a stitch used in tailoring or embroidery. Will you forgive me if I tell you the ending? There’s a girl. She’s standing where the park outgrows itself and the manicured lawn gives way to longer grass and the stubble of rocks. She is standing in no-man’s-land, between the park and the place where the mill yards begin. It’s night and the cane trains are still. It is unbearably humid and she feels the sweat sliding down her back and she presses her hands there into the fabric to stop the sensation that is ticklishly unpleasant. She lifts up the midnight dress to fan her legs. It’s true, the dress is a magical thing, it makes her look so heavenly. After a couple of pages from this narrator, the chapter continues with the story from the beginning. Rose Lovell arrives in town with her father at the Paradise caravan park where they will live for the next few months. She meets Pearl Kelly in the next day or so when she goes to school. They will be the central characters of the story, but there is also Edie Baker, an eccentric dressmaker with a history, Rose’s alcoholic father, and Paul Rendell who runs a Book Exchange in the back of his mother’s shop. The first chapter sets the pattern for the rest. There is always a preface from the narrator, helpfully written in italics, and then the continuing story. There’s the feeling of two paths, with the main story slowly catching up to the point where the narrator’s brief snippets begin. The two teenage girls are trying to establish their identities. Rose has been on the move with her father for a number of years after the apparent drowning suicide of her mother. She has had little chance to establish friends, and she connects surprisingly well with both Pearl and Edie, who agrees to help her make her dress for the Harvest Parade. Pearl is trying to work out who she is too, looking for her Russian father, by writing to men surnamed Orlov in Moscow. As Rose and Edie make the dress, so the tragedies of Edie’s life emerge. After a stuttering start, the book gathers pace. The author drops information all over the place and there are many little stories for the reader to piece together. It is a very effective technique. So for me, Karen Foxlee is a new author to watch out for. A great book, not just a coming of age novel, but a well constructed mystery on many levels. The author’s debut title, THE ANATOMY OF WINGS, published in 2009 looks interesting too. (My local library lists it as teen fiction).